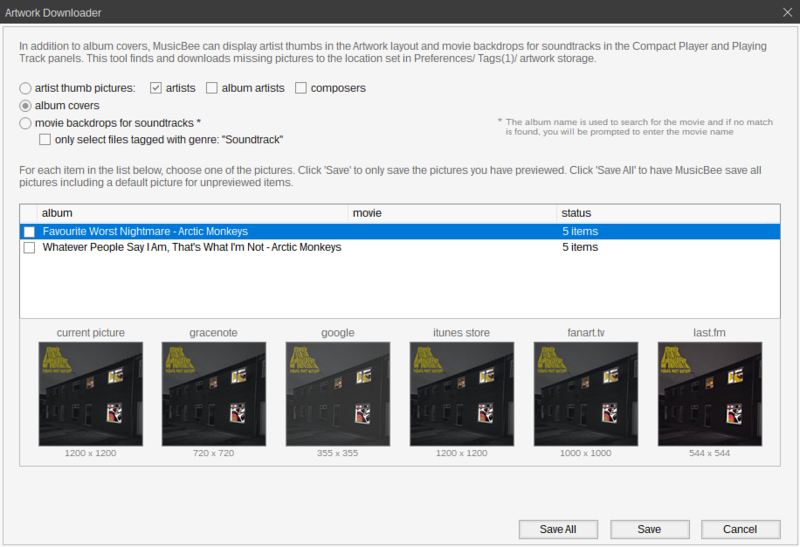 This bug is could result in you getting a lot of junk data in your collection, because even if you spend your time and go though previewing and selecting images, MusicBee will download and apply images to your files even if you have unselected them. In the Artwork downloader tool you are given the option to preview and select which images to store in your files. You have the option of selecting which source. If you do not like any of the options you can uncheck that item. The bug is that even if you uncheck an item the tool will still save the picture in your file! 2. Click preview to start looking at the results. select a photo for the first two tracks. 3. For the 3rd track I have only one result from google, it is highlighted. This result is not appropriate at all so you click the checkbox to uncheck the selection. (meaning you do not want the image). Click save all. 4. Return to the main window, click on the track that you did not want the image and confirm that it was actually downloaded! The bug is that when you use the checkboxes to uncheck a selection, it doesn't actually deselect the image. To do this you have to click the current image box. When you do this then the checkbox disappears and the image is deselected as expected. The bug is that the checkbox uncheck event is not properly linked to the action which means deselect any image results. A screenshot might be helpful here. The checkbox (in the white area) is to select the track for searching. Once the search is complete, the check marks go away. The instructions state that "for each item in the list below" (nothing to do with "selected" or "checked", just shown) "Click Save..." Nothing about checkboxes has anything to do with saving, only searching.